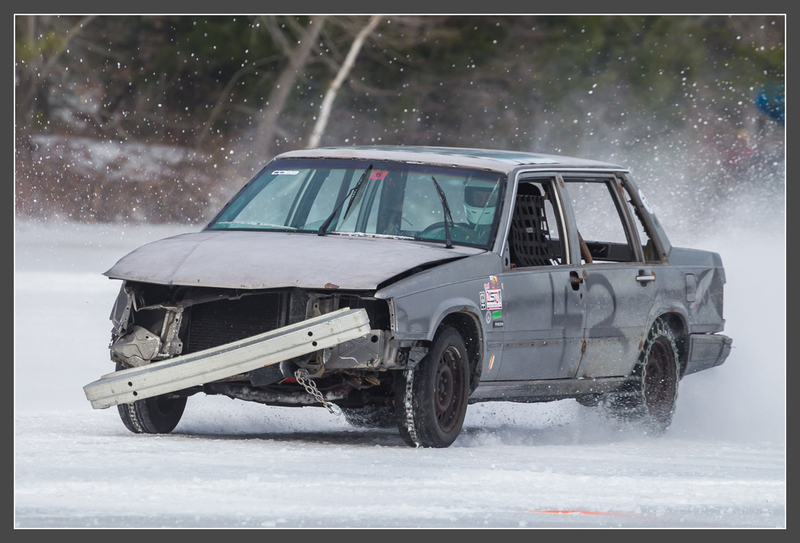 Thus far, the relative success of building a suitable race car between the start of fall and the ice racing season has come down to a basic willingness to do the work; actual competence has barely been necessary. Taking things apart is easy, much more so if they never need to go back together as they were, and common-sense modifications that aren’t explicit in the rules are monkey-see-monkey-do against what I’ve observed. Now, it’s time to do the thing though, and the fact seems to spite all of the preparation. 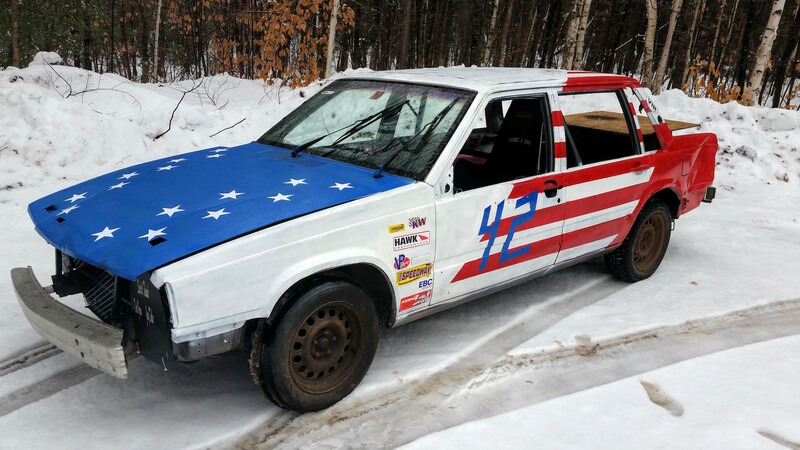 The day of the first race finds me on the beautiful backroads of New Hampshire, driving quickly to a pond while pleading with the pit steward over the phone to keep tech open a bit later than usual, my partner in this venture some distance behind with the racecar. I’m able to stall until he arrives, with only enough time to pull the car off of the trailer for a double-speed inspection before being sent on track with my class. I enter just behind the pack halfway through the pace lap, for an immediate green flag in the first heat race of the season. The first couple of weekends amount to shakedown and testing, having not actually driven the car much further than onto the trailer. I braced for, and did receive, humble pie. 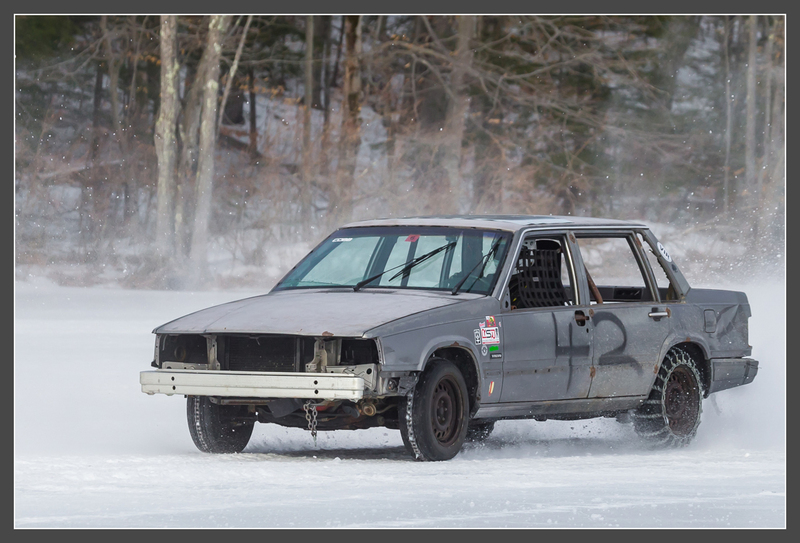 With sufficient ice, the Lakes Region Ice Racing Club runs every Sunday with the occasional plus-Saturday double-header weekend. Each event has, for each class, a practice session, a five lap heat race, and a ten lap feature. Lots of racing, and plentiful opportunities to find mechanical trouble. We encounter our literal weakest links right away: The eBay-grade tire chains sourced for the rear tires fail quickly, throwing cross links through brake lines and stretching beyond recognition. Installed ignorantly, the roller chains on the front tires fall off with the same comical immediacy. We also break the exhaust off just after the header, dragging it by the oxygen sensor, and manage to slightly damage the frame in a moment of odd–angle contact, but these can be quickly fixed and dealt with later. Our failing traction devices, plus my lack of skill and inexperience on ice leave us noncompetitive, but the few races we’re able to finish without issue do belie some inklings of promise. I worried that we would be hopelessly outmatched in all respects, since the state of the other cars hinted they’d been here before, so to speak, but the conditions are an equalizer, and there seem to be fewer, ahem, creative explorations of the rulebook’s boundaries applied for a competitive advantage than I’ve seen elsewhere, maybe because there’s relatively little to be gained by dominating here. As such, a Volvo 740, unmodified but for the removal of various bits and pieces, may not be so far off of the pace if all else were equal. By the next weekend we’re using larger, more aggressive chains front and rear, and have fixed most but not all of the other functional issues with the car. Unfortunately, the new chains have caused as many problems as they’ve solved. My own laziness precluded taking some very good advice, that my new studded rear crosslinks truly need to be sharpened to work even as well as what they replaced. Worse, it’s nearly moot because they’re still not tight enough, so the car skates along the sides of the studs. It was also recommended that we spike our roller chain links, and after speaking at length to one of the most successful racers in the club, we decide to start by simply copying a setup he uses, spiking only the inside (read: left) tire. As it were, our respective cars each respond quite differently to this setup. Unfortunately, there was only a brief window of opportunity to discover this, as the snowmobile track studs chosen were too long and snapped off at the first whiff of lateral force. The video at the top of this page was of the point in time at which we were learning these things, which should help to explain at least the acute lack of traction, though there are no excuses for my own failings on display. The silver lining to these problems is that through the process of addressing them, the surface and its interface with the car are beginning to make sense; we can start to understand how changes to both the car and the conditions of the ice will affect the operational behavior. The next race is noteworthy: For the first time in over thirty years, in an agreement between the club and the town of Meredith, a Saturday race is held on Lake Winnipesaukee proper, right on Meredith Bay, rather than the nearby ponds which are typically used. Many in attendance were not yet born when a race was last run here. This is a popular ice fishing destination, and one can sense those who come only for that feeling as though they’ve suddenly been dropped into Bizarro World as the technicolor convoy of race cars pass the shanties. Several racers from other regional ice racing clubs have also joined for this race, and suffice it to say they end up doing quite well. The ice is particularly rough here, and a cold night hardened everything up significantly. But the conditions are what they are, and from behind the wheel the only thing that seems genuinely out of the ordinary about the track is the size of the crowd that comes into view as you enter the front straightaway. Having spent the week prior to this in the basement with an angle grinder, sharpening studs in a noxious cloud of cut-off wheel dust, I was eager to enjoy the fruits of my labor. All I found was traction at the rear which far outstripped that available at the front, having neglected to re-spike the roller chains for lack of time. This is a nightmare, as the situation calls for rotating the car very early, and there’s no power available to maintain a slide. Even the most aggressive chuck-in possible cannot muster enough momentum from the rear end to keep it from quickly catching and throwing the front of the car straight, and the weight imbalance from so thoroughly stripping the vehicle exacerbates the issue. But, it’s still hard to avoid having fun while racing on ice. The next day, Sunday, would be the last day of racing this season, unbeknownst to us at the time. Most of the prior week had been unseasonably warm, and created a tenuous situation on the smaller bodies of water. Cycles of thawing and freezing over created layers of water and soft ice that was quickly worn away, and within a few heat races, moving the boundaries after each as the racing line became a growing gulley, the only option was an entirely new track, prepared on the other side of the pond. The true heroes of these events are the plow drivers, who arrive early each race day to check the condition of the ice and prepare the track. In this case, they were able to clear an identically-sized track within fifteen or twenty minutes, while we took an intermission, and lined all the race cars up for the assembled crowd to inspect. Unfortunately for our team, after this, the car would not start. The wipers had begun slowing during our heat, and the car felt down on power, more so than usual. I had driven to the intermission area right after our race, and as soon as it’s turned off there, it’s dead. We jump-start it once pushed back to the paddock, but once the external power source is removed, it stumbles, and we decide to use what little strength the car has left to get it onto the trailer, rather than attempting to participate in the feature. The next week brings more warm weather, and the ice doesn’t recover. This makes for an abnormally short racing season: Typically this runs into March, and it’s only halfway through February. Our car simply needed new brushes for the alternator to be race-ready, but with the season suddenly over, it takes a moment to set in that there’s no need to rush fixing it. As a team the two of us are ready for a break, but many of the cars I had raced against also run the local dirt tracks during the summer, and will roll right into another schedule of events. For a while, I wanted to distill the winter’s activities into some overarching Racing Truths that I could tell myself I had learned, rather than allowing it to have been but for the sake of a good time with good people. I even asked our esteemed host, one Mr. J. Baruth directly for guidance, sending a video similar to the one above and asking if there was anything that I should try to wrest from the experience and twist into my goals of road racing. The response was obvious in hindsight: No but who cares, it looks like fun. Lighten up, Francis. If there was indeed anything broader gleaned from this, I can say that my appreciation for oval racers, and the ladder they climb, has deepened greatly having been exposed to the grassroots. The road course is still my main squeeze, but I’m now drawn to both, with the only thing preventing a competitive effort (to be fair, in either) is the perpetual financial pressure of real life. Every door that has been opened for me in motorsports has led to wonderful experiences, and this is no different. The welcoming, enthusiastic, and extremely hard-working racers, plow drivers, mechanics, and families of the Lakes Region Ice Racing Club will absolutely keep me turning left on the ponds Berry and Lee this winter, next winter, and for as long I’m able. I urge anyone remotely near the area to come check out a race and say hi. But if you happen to have an old car, a trailer, and time for a winter hobby, be careful; you might keep coming back. Until then, there’s work to be done. Great to see the third part! Are you thinking about the spring/summer dirt season in your battle tank? It isn’t in the plan, but I’m not exactly sure what is yet, so that could change. I didn’t expect to see a first gen MR2. He has… several of those, and 300-something trophies. Looks like a great time a good job on the write up.